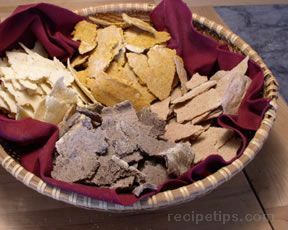 Making crackers is quick, easy and fun. They can be made with various seasonings and many different kinds of grain. Try cornmeal with chili powder, rye with caraway or dill seeds, or whole wheat with garlic powder. Experiment! If made from cornmeal, buckwheat or other non-gluten grains, they can safely be eaten by gluten-intolerant individuals. This recipe makes a semi-crisp, dense cracker. Mix together well, preferably in a food processor, 1 cup of the flour, 1/2 teaspoon salt and oil or butter ( use smaller amount for crisper crackers, or a larger amount for a richer flavor). Add 3 tablespoons water and mix well. Gradually add more water, mixing after each addition, until mixture forms a compact ball. If it seems too sticky to handle, add more flour. Sprinkle a work surface (or a baking sheet-sized piece of parchment paper) with some of the remaining flour then press and roll the dough to about 1/8th inch thick. Try to get it fairly uniform. If the dough is too dry to roll out, return it to the food processor and add a little more water. If necessary to prevent sticking, dust your hands and the rolling pin with a little more flour. Put the rolled-out dough on a baking sheet dusted with a little flour (if you've used parchment paper, transfer dough and paper to baking sheet) and bake 10 - 15 minutes, until somewhat brown. Cool and break into pieces. If making several batches, mix another while the first one bakes. You can re-use the parchment paper several times. *Any finely ground grain such as cornmeal or buckwheat can be used for the flour in this recipe.